One of the best parts about following the professional scene is seeing how your favorite players grow over the years. Their skills evolve as new challengers emergy, and they must keep up with the times or be left in the dust. Of course, for some their peak isn’t quite as high as others, while a special few will blow through all expectations. I first met Serral in early 2013, and I’ve been following his career trajectory the last five years. He finally started playing full-time in the spring of 2017, and his results have been nothing short of breathtaking, fulfilling his potential in a way no one could have foreseen. There’s just something fascinating about the way he approaches series, how he’s able to nail those clutch moments, and how he just doesn’t die. For me, watching him play is an emotional reminder of why I started following the game in the first place all those years ago. My prediction then isn’t based on anything resembling an objective, unbiased assessment of the remaining eight players. I want Serral to win. In the end I don’t even care who he faces in the finals, because as long as he takes a total of ten games over two days, he will have played the most memorable year of StarCraft in living memory. It will be the most important story in the history of the game for me, overshadowing legacies of the likes of Mvp, soO and INnoVation. Some might say that dreams don’t really come true, doubly so for StarCraft 2. I’d argue that this year BlizzCon shouldn’t be treated as a logic puzzle, but we should instead embrace the emotional journey of the tournament, no matter where it takes us. If Serral is surprised by Dark in the very first series, it’ll be an utter disappointment, but it’s precisely because of that very chance that we should let ourselves dream. Hope is the emotion our shared humanity is built on, so let's revel in it. This year we've earned it. I can’t speak for everyone, but personally I’m glad to have opening weekend over and done with. Some of the games were fun, others weren’t, but here we are with eight really talented players facing off to decide who becomes the WCS World Champion. The Round of 8 kicks off with what, in my mind, is the most lopsided matchup of the weekend. I’m picking sOs to steal a game that goes horribly awry, but there’s no way he’s gonna piece together three wins against someone like Maru. Stats, meanwhile, is going to have his hands full with SpeCial, but I think his championship pedigree gets him over the hump. Rogue versus TY seems like a good match on paper, but I’m pretty certain Rogue is going to wipe the floor with the struggling Terran. Serral versus Dark is definitely the highlight of the round and, while Dark looked excellent against ShoWTimE, I don’t think he holds a candle to the Finnish Zerg in ZvZ, which has to be considered Serral's bread and butter. The semifinal between Maru and Stats is perhaps the hardest match to call in the entire tournament and I wouldn’t be surprised to see it go either way. Both are transcendent players who have scored wins off each other in the recent past. Maru humbled Stats in season 1 of Code S, but Stats brought him back down to earth in the GSL vs. the World even though the many in the community considered Maru unbeatable. Both players have what it takes to win BlizzCon so it might just come down to who gets the better sleep the night before, but I think, more times than not, it’s Maru who comes out on top. Down in the lower bracket, we get another wonderful ZvZ, with Serral getting the better of an elite Korean for the second straight round. And here it is! We’ve waited all year for this match and now we finally get. Maru. Serral. Seven games. 280,000 dollars (and a champagne bottle-less celebration) going to the winner. What more could you want. I’m picking Serral 4-3 in a final so great it takes Tasteless a year to get his voice back. If there’s one lesson I’ve learned in life, it’s that dreams don't come true. 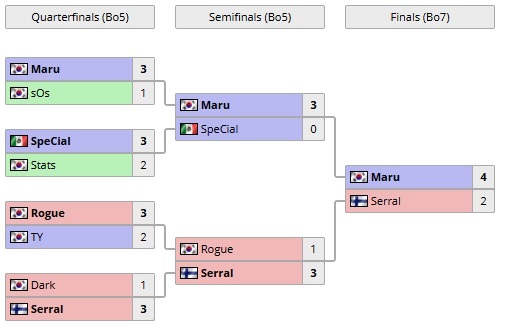 The dream final here is obvious—Maru vs Serral. And I expect both of them to advance past their first round opponents. sOs has frankly looked poor all weekend, and somehow looked like the weaker player even in the series he won. I expect Maru to beat his teammate comfortably. The casting panel largely regarded this part of the bracket as easier, and while I agree with that, it doesn’t mean they should be rolling out the red carpet for Maru just yet. Because we’re all sleeping on Stats. He’s had to show nothing but PvP—in which he looked dominant—and now has nothing but PvT to prepare for. As good as SpeCial looked against Classic, I think Stats is a step above and will shine in a longer series. And Maru? Stats beat Maru in GSL vs The World. Stylistically, there isn’t a single Protoss better equipped to handling Maru. I expect a close series between the two, but I can see Stats taking him out and denying us the grand finals we’re all hoping for. Serral, on the other hand, I do see in the finals. He’s a better player than Dark at the moment, and if there’s anything Serral doesn’t lack it’s ZvZ practice—top notch ZvZ is required for any Zerg aiming to win any WCS tournament. And because I also believe that Rogue will edge out TY, I see Serral ZvZing his way all the way to the grand finals. The Finn should feel perfectly comfortable with that prospect—it sounds like every WCS ever. This would set up a rematch of the GSL vs The World grand finals between Stats and Serral. At the time, I thought the scoreline represented their respective skill in the match-up quite well. Stats is probably the best PvZer in Korea, but Serral has the best ZvP in the world. If the two meet in the finals of BlizzCon I expect a similar scoreline, and I expect Serral to win the tournament. BlizzCon has always been about surprises. Most of its champions were never pegged as favorites to win and yet they did, making this tournament a very odd enigma to crack, seeing as all the by the book predictions failed to materialize. However, this year it finally seems as if we’ll be getting a ho-hum scenario for BlizzCon. sOs, whilst being a more cumbersome opponent for Maru than most Protoss, is no real threat this time around to Maru as his lukewarm performances in the earlier rounds have made it so that bar a miracle he’ll go down in flames. Stats and SpeCial would normally have been touted as another Korean smackdown, but the fact that SpeCial made through Classic to get here is something to take into account. SpeCial easily played the most entertaining and solid series against Classic’s strong PvT to get here, and while Stats still with his overwhelming consistency should pull ahead, it may become a tougher road then expected. Maru and Stats should be a nail-biter, seeing as Stats was one of the few who managed to turn the tide against Maru’s tsunami. Ultimately, for both hype and dirty Terran biased reasons, I still see Maru blazing through towards the finals. On the lower half, the result is pretty much straightforward; Serral to the finals. Dark despite his bravado has been seen to bleed against foreigners, and Serral is obviously no stranger nor slouch in ZvZ. Rogue should, with his better showing, edge out TY who looked more than mortal in his opening week, leaving us with again a ZvZ for a finals berth. Again, Serral has the upper hand with his momentum and skill in the mirror, although Rogue won’t go down without a fight. 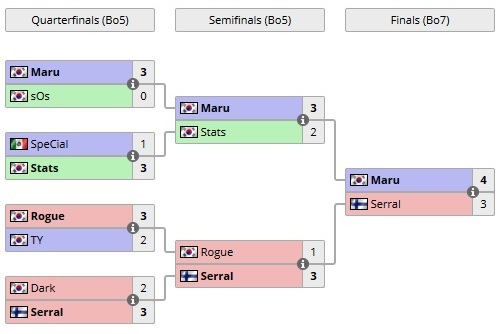 As fate would have it, this would set up the finals match everybody wants, the battle between the regional champions in Maru and Serral. Here, its anybody’s guess as to what might happen. Both have momentum behind them and neither of them lack in skill, so it would be no surprise to see either win. I’ll have to coinflip this. Well, you guys know me; I've never been all that shy to make a bold prediction. So, where's the crazy stuff in my Blizzcon bracket? Well.. there isn't really anything crazy. Which, in itself, is insane. How is predicting a foreigner to win the biggest tournament of the entire year not insane? The fact that we've even got here is bewildering and incredible. So, let's get into the meat of the prediction. One, I expect there to be a lot of blood; Maru vs Stats will be awesome and tightly-contested, and TY vs Serral will be a legitimate test for the foreign prodigy. But I feel like destiny has brought Serral this far, and him failing at the very last hurdle wouldn't make as beautiful a narrative as him finally overcoming it all would. In terms of 'lighter' sets, SpeCial vs Stats is not a set to sleep on. Seriously, SpeCial showed pretty nice form in groups and has always been one of the most driven players in the league, and Stats is just all-around awesome. I expect either that or Serral vs TY to be the best set of the tournament. I think TY will beat Rogue, partially because I believe TY is really good (although he didn't show up fully to groups) and partially because it'd just be goddamn lame for Serral to make finals purely on the back of ZvZ and I think not-lame predictions are ideal. In terms of the ugly, Serral vs Dark is likely to be one-sided but I do think Dark will steal game 1 to make foreigner fans everywhere panic, and I think Maru utterly stomps sOs to give us a good dose of sadness to start things off. At this point it looks like Super Tournament was no more than a bug in the matrix, and so far BlizzCon miracle sOs hasn’t shown up either. So, assuming everything goes smoothly—which, of course, is never guaranteed with sOs involved—Maru’s course to the semis should be rather straightforward. As for SpeCial and Stats, the Mexican’s upset against Classic surely built up his confidence, but Stats is a different kind of beast. SpeCial surely will put up a good fight, could even bring Stats to the brink of defeat if everything goes well, but in the end Stats is more experienced and more solid in my eyes. Rogue and TY have both dropped maps to their foreign counterparts in the group stage, but overall Rogue looked much more solid and confident than TY did so far. That said, this should be an interesting ZvT series, with two such brilliant minds put up against each other. For the next match, I’ll clearly state that my heart is certainly with Dark—and should he prevail, I’m with him all the way—but at this point no one can deny the power that is Serral. In fact, the only person being better at doing what Dark normally does—killing dreams and hopes—is Serral. The Finnish giant is vulnerable in ZvZ, and Dark certainly has the capabilities to use that, but more often than not he gets into his own way in situations like these. Going into the semis, while Stats certainly could pull through here and advance into the finals himself, Maru seems like the safer bet. He’ll be able to make some on the fly adaptations to his plans by watching Stats and SpeCial battle it out, while Stats probably won’t be able to learn much from sOs. In the other match, Rogue may be the defending champion, but more often than not this year he fell flat when it really mattered. Serral on the other hand stayed calm and collected in even the diciest ZvZ situations, a useful talent to have for this scenario. Which brings us to the potential Grand Finals most viewers dream about. It’s possible that Serral is the meteor ending the age of the great Korean predators. But I think their age is not quite over, yet. Both Maru and Serral are proven stone cold killers with ice water for blood, but in all the years of watching StarCraft 2 I have learnt one thing: of all the icy veined killers on this planet, Korean Terrans are by far the scariest. Predictions have never been my forte. Though, perchance, that might be a good thing - for that very reason I haven't given in to the allures of sports betting. And, although there's technically nothing at stake, I always dread having to draw bracket predictions. Yet, somehow, 2018's professional StarCraft II competition has (for the most part) delivered fewer upsets than years past. and Serral. The established storyline would have us believe a reality where the two don't meet in the finals is about as probable as Sean Bean's character living to see the end of the film. taking down the cream of the crop in the last OSL ever held. From there on, Maru kept delivering. With three GSL victories and a hefty $200,000 picked up at WESG in 2018, the Hamster Terran seems all but unstoppable. Could Serral turn out to be the one to take him down? For the past eight and a half years I've been watching Koreans take tournament after tournament, trophy after trophy, making use of arcane RTS knowledge begotten in darkened alleys lit only by the faint neon glow of PC Bang signs. That's the natural order of things. Koreans always win. Serral will most likely end up making it into the finals off his ZvZ pedigree. But in the end, the mantle of World Champion has to go to a Korean. I'm not ready for the spell to be broken. TL writers disappoint me. We've seen more than enough Zerg in the final of BlizzCon that I'd take any other matchup as long it doesn't have Zergs in it. Oh, what's my dream finals? sOs vs TY. Is this the stupidest prediction? Maybe. Only time will tell. Hey! wait a second, hold on. What about us? Give us a thread too. With bulletproof/solid (more than Ollis) predictions from TLnet users too. Voting with my heart is precisely what led me to my prediction. 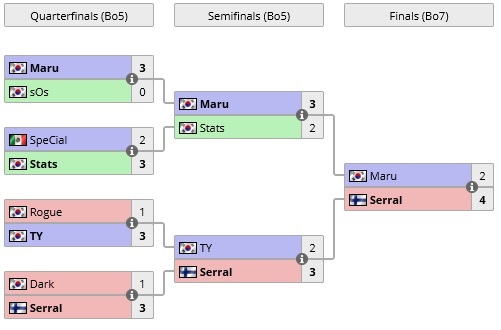 4 Serral winner and 3 Maru winner? Oh these predictions make me so scared. When almost everyone is predicting Serral and Maru in the finals I'm almost 100% sure that things will not turn out this way. One can only hope for the foreign hope..
Lol... its extremely doubtful that Serral will even get to the finals, but even if somehow, there is absolutely no way he beats Maru. 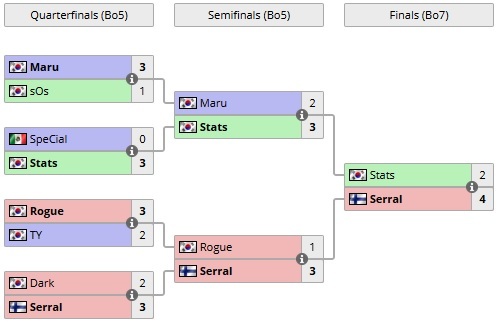 If we get Maru vs Serral finals its going to be 4:0 in 20 minutes. Hope we get that Maru vs Rogue epic best of 7 that everyone really should be longing for ! "a final so great it takes Tasteless a year to get his voice back." Love Olii's prediction actually. But, I think everyone is predicting with their hearts. I just want to watch an unrivaled legend be born - Maru. Olli as usual trying his hardest to be a dissenting opinion just for the sake of it. I used to think it was just his thing, but now I understand that he was just being a modern "hot take" sports writer before they really became a thing everywhere. A dissenting opinion would be if someone actually dared to not put Serral in the finals. What Olli showed is just mild disagreement over details. HeRoMaRinE should have won this series. Your heart is wrong. You know this to be true. We all know how this works, every single TL writer predicted serral in the finals, gl buddy. Olli saved Maru at least so that's nice! So the semis are gonna be sOs - Special - TY - Dark, right? Dread it, run from it, TL predictions arrive all the same. All jokes aside, I feel like you are really sleeping on Dark. I agree Serral is a ZvZ god but if Reynor could take 3 games off of him then Dark could definitely beat him. Should Maru vs Stats happen it should be the most exciting match before the finals, the best P vs the best T in the world and both have practiced and proved their strength in the matchup. Really hope sOs wouldn't mess it all up (I don't think Special beats Stats in bo5). TY's gonna either throw a 2-0 lead or get straight up swept.